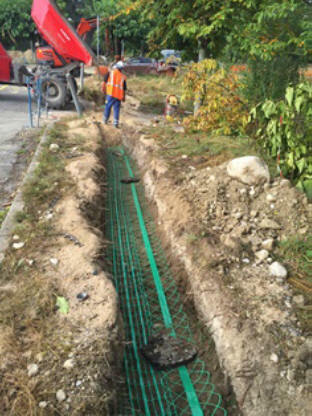 An optical fibre trench (OFT) is a civil engineering work aiming at deploying optical fibre ducts or direct buried optical fibre cables. An OFT may be required for enabling a modification of the existing fibre infrastructure or to create a new or alternative path in respect to existing infrastructure (e.g. technical galleries, “caniveau”). OFT are usually located along roads and where future construction activities will not overlap the installation. Secondly, the trench should be as direct as possible without causing excessive damage to the roots of trees, shrubs, or other vegetation along the route. Depending on the method, trench width can range from 60 cm to several meters and being more than 100 cm deep . During the study phase, the project manager shall specify the requirements concerning the trench layout, the duct types, duct test requirements, manhole specification as well as the duct layout inside the trench and the manhole. In addition, Project Manager shall ensure that the installation is prepared and executed correctly by establishing acceptance milestones that will enable periodical joint inspection for acceptance of works per phase (e.g. trench digging, ducts layout before refilling, filling up to sand layer and green net, etc.). WHEN IS AN OFT NEEDED? • No physical routes (e.g. technical gallery) are existing already between two different locations. • The existing routes are overloaded, preventing the correct installation of new Optical Fibre Ducts (OFD) and cables. • The existing physical routes are not suitable for blowing operation due to tight changes of directions. The OFT built between GT6 and GT796 is an example (see red line in Figure 2). Opposed to a cable tray, OFT protects buried services with backfill material delivering a high-level protection. The Project Manager shall identify all the existing underground services and formations prior to the design. At first, they need to establish the geographical position of all underground services, including deepness, by means of existing paper layout and GIS services. Further inspection on the fields are also to be done in order to validate the information coming from the existing documentation or to recuperate missing information. In particular, GPS surveys might be need to identify duct routes and manhole positions. The services identification request is addressed through a “Declaration d’Intention de Commencement de Travaux” (DICT) which shall be sent for approval to Project Manager. Any trenching done near existing services should be done very carefully to prevent accidental damage to a service. Hand excavating might be necessary to uncover known services prior to commencing with mechanical excavation. Areas where work is to be performed shall be cleared of all trees, shrubs, rubbish, and other objectionable material of any kind, which, if left in place, would interfere with the proper performance or completion of the contemplated work. 2. Place 40 mm or 50 mm OFD directly underground. Solutions 1 is preferable when a higher level of protection to the underground services is to be delivered as well as when the number and type of 40 mm and 50 mm OFD is not defined yet. Solution 2 is preferable for long OFT (longer than 40 m) or if changes of directions encountered prevent the bigger pipes from being installed. 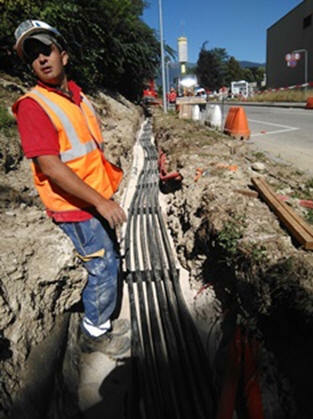 The OFT shall be as straight as possible in order to ease the pulling of buried ODF or future cable installation. It is never ideal to have directional changes, but if unavoidable one shall keep the bending radius as big as possible (at least 10 times the duct/pipe diameter) and offset in the same direction. If a tight change of directions (e.g. 90 degrees curve) cannot be avoided, the installation of a manhole (MH) shall be considered. Rigid ducts shall then be cut at the MH extremities and routed inside with flexible duct. The OFT route must be documented on construction drawings for use in the field. The construction drawings should show all underground utilities and obstacles. Any deviation between the planned OFT route and “as built” OFT route should be noted on the construction drawings and transferred to the permanent route drawings and maps. It is immensely important for OFT to be excavated to such a depth that the crown of the OFD has at least 700 mm of backfill cover. Where it is not possible to obtain the specified minimum trench depth, Project Manager must be consulted. 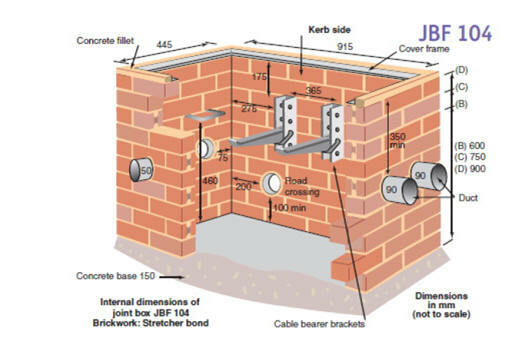 Concrete encasing is to be avoided as it turns a previously flexible duct into a long unreinforced concrete beam, prone to fracture with ground movement. A large concrete slab might be considered over the crown as an additional and punctual measure of protection if the requested depth cannot be provided at a specific location. • Then back filling and finally asphalt or topcoat. Backfill material is to be installed in layers not exceeding 30 cm, with each layer compacted before the next is added. In addition, too narrow OFT will not allow for proper duct installation whereas too wide OFT will result unnecessarily costly. The minimum distance for a new cable/duct to pass under other network is 0.80 m. The minimum distance for a new cable/duct to pass next to other network is 0.80 m.
It is obligatory to respect the minimum distances. Other distances will be considered where the minimum distance cannot be respected, dependent upon CERN approval. The Project Manager must be notified of this prior to commencing any works. Project Manager shall validate the final OFT construction plan prior to the starting of the excavation works. OFD shall be suitable for buried installation as well as for blowing of microducts. The diameter can range from 25 mm to 50 mm. OFD must be installed without any kind of intermediate joints between manholes (MHs). If this cannot be possible, Project Manager shall be informed during the study phase. The manufacturing length of the OFD shall take into account the required total number of OFD and each individual total installation distance to prevent any intermediate joint. Any damaged duct during the installation shall be removed and replaced by a new one. In case of minor damage or if the duct cannot be replaced, an intermediate transition chamber can be installed with the prior approval of Project Manager, to allow duct access in case of microduct blockage (i.e. this can be a L3T chamber 1 m by 1 m). It is advisable to foresee a certain number of extra OFD. This will prevent from opening the OFT in case some non-conformities are detected during the tests. ● To limit the overall distance of the OFT, allowing intermediate (mid-point) blowing or pulling. Indeed the MH allows splitting such operations in several steps, decreasing the friction of the component (i.e. pulling of ducts or blowing of microducts). ● To allow tight change of direction, bigger than the bending radius of the buried OFD. MHs shall be positioned as far away as possible from road junctions in order to make easier the excavation operations and the future access. Manhole are to be sized sufficient to allow unobstructed access for cable pulling and blowing as well as to accommodate the bend radii of all planned ducts. Actual size will depend on the number of duct entries the MH contains and the purpose it is principally designed for. The default manhole shall be a L5T. In case more than 12 OFDs are to be terminated, a specific custom-made MH shall be designed. MHs shall be large enough to accommodate splice closures. The installation of a MH deeper than 3 meters is not advisable as this will be subject to “confined space” regulation. OFD entry points into MHs must be drilled, without cracking or damaging the surrounding structure. Ideally, any aperture shall be made in the building fabric by core drilling or other vibration free means. OFD entries into MHs are to be spaced at least 5 cm apart, both vertically and horizontally, and at least 20 cm from the base and 25 cm from the adjacent side walls (see below Figure). A smaller distance can prevent coupling connectors from being correctly installed. Any aperture shall allow for a minimum of 1 cm of resin mortar to be applied around circumference of any OFD. OFD are to be cut so that a protrusion of at least 50 cm are left into the MHs. It is extremely important during the installation to ensure that distances between ducts are respected. MH shall be equipped with a drainage system to allow water drainage. The MH lids shall be complaint with safety rules and secured against intrusion. All lids shall be equipped with an automatic closing system with anti-theft device. Hinged system are also to be installed in order to prevent accidental damage to the underneath services. It is advisable to install triangle lids whenever possible in order to reduce the overall weight of the cover. Type and frequency of road vehicles passing over the lids are to be carefully considered when choosing the robustness of the lids. Lids installed on a road shall bear 400 kN strength whereas others 250 kN. Lids are to bear a permanent identification label defined by Project Manager. Coupling connectors are to be used inside MHs to join OFD. As for the OFD, the connectors shall stand pressures higher than 16 bar and be suitable for blowing operation. It shall be compatible with all possible materials (i.e. PE, PVC). Datasheets of coupling connectors validated and used at CERN are attached in . All the works are to be scheduled in compliance with the needs of Project Manager. External surface of OFD and protected microducts shall be checked by visual inspection prior and during the installation. Crushed or damaged OFD shall not be installed. OFDs crushed or damaged during new installations shall be removed and replaced. It is the responsibility of the contractor to ensure that every law regarding traffic, safety, traffic signs and barricading is complied with. When placing the OFD into an open OFT, the bottom of the OFT must be reasonably flat, free of horizontal and vertical bends, and free of stones and debris. If surrounding soil contains sharp stone or other materials, the OFD should be insulated with a protective layer of fine sand (approximately 20 cm under and above the duct). OFD extremities from drum must be carefully inspected before pulling. No visual damage in outer sheath shall be accepted. OFD shall be as straight as possible, laid in a straight line between MHs. In case of any directional changes, the bending radius shall stay as big as possible. A minimum bending radius of 10 times the outer OFD diameter is to be maintained. When possible, all OFD shall be sloped properly so the will drain into the MH and away from the building entries. OFD can be placed into an open OFT either directly from a drum or from temporarily laid alongside the OFT and placed later on. It is not recommended to hang OFD on fences, barriers, etc. When placing multiple OFD in a single OFT simultaneously, it is important not to cross or twist the OFD inside the OFT. When installing large quantities of OFD it is possible to stack them one on top of the other in addition to side-by-side. However, the OFD are to be spaced at least 2 cm apart, both vertically and horizontally, and attached together by means of an OFD spacer. If ducts are to be deployed in more than one group another, these shall be separated apart by a 10 cm sand layer. The distance between is to be checked every 10 meters in the straight trenches and every one meter in the curved trenches. Checks is to be made before the trench covered by the sand or concrete layer. 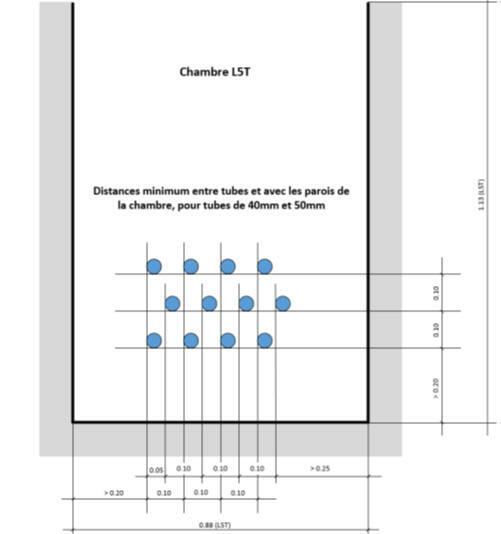 The measured distances will be reported in a data sheet. OFD spacers should be installed every three meters. They prevent OFD from twisting over and around each other. By keeping the OFD in straight alignment, cable blowing and/or pulling tensions will be reduced. A detectable GREEN signaling net shall be installed in all OFT. The tape shall be laid according to the layout in Figure 5. Pulling ropes shall be installed and left in every new OFD, following OFD laying operations and satisfactory tests. At approximately 5 meters from the MH, the OFD formation shall open out to provide the sufficient gap between each OFD. OFD shall enter and exit MHs in line with the direction of the route, for them to be coupled without any obvious effort, as a continuous OFD. Unless otherwise required by Project Manager, the OFDs shall enter a MH at such depths that will ensure a minimum clearance of 60 cm below the ground surface. All OFD entries and exits MHs must have a watertight seal, to prevent water, dust or any other foreign articles from entering into the OFD, and a proper waterproof label. OFD are to be tested and proved with a calibration and pressure test. The tests shall be performed after the installation of all OFD with the OFD covered by the sand or concrete layer. In case of concrete layer, it is advisable to do the calibration tests before and after the concrete layer is deployed. It is also advisable to verify that all ducts have a good caudal of air at the exit prior the starting of the tests. The contractor shall organize, supply the necessary test tools and execute the checks and tests. The contractor shall communicate to Project Manager the dates of the tests with at least two working days’ notice. Each OFD installed shall undergo a cleaning and calibration test at the end of installation. The OFDs shall be cleaned over their whole length by sending a sponge of appropriate diameter. The uniformity of the internal surface shall be assured by conducting a calibration test of the duct. This shall be done by sending an appropriate caliber (~>=85% inner duct diameter) in the OFD under pressure. The caliber shall go across the installed ducts without interference. Any non-conformity shall be immediately reported to Project Manager. After the test, the OFD extremities shall be sealed to avoid the entrance of dust and external bodies that could jeopardize the pulling of the cables. Here the sequence of tasks for cleaning and calibrating the OFDs. § A sponge is typically 100 mm in length and 2 times the OFD diameter. § Wet the sponge slightly with blowing lubricant. § Place the tight-fitting foam sponge inside the OFD. § At a maximum pressure of 4 bars, blow the sponge through the OFD. § If excess water or dirt exits the OFD, repeat the process. § Have a sponge catcher in place at the far end to catch the sponge when it emerges. § The sponge test MUST precede this test - a calibre can damage a dirty duct. § At the receiving end, a catcher must be used. Note that a flying calibre can cause injury and/or damage! § Always inspect the condition of the emerged calibre, visible grooves is an indication of duct indents. Each OFD installed shall undergo a pressure test to certify the tightness. Each OFD with a diameter less than 50 mm shall be pressurized with air or nitrogen at 10 bars for a duration of one hour. Conditions can be 2 bars for a duration of three hour in case the OFD diameter is larger than 100 mm. The admissible pressure drop at the end of the test is 10% of the initial pressure. The pressure shall be recorded every five minutes during the entire test period. § Fit a high-pressure end-cap to the OFD under test on the far-side. § Gradually build the pressure up to 10 bars. § Test all coupling used for this test for leaks, using soap, water and a sponge. § Connect the air feed and leave this open until the pressure in OFD stabilizes at 10 bars. § Close the air valve on the test assembly and monitor the pressure gauge. If an OFD fails the integrity test, the duct shall be rejected and Project Manager informed.